radiograph until the incisal edges of the teeth point down. With the back of the mount toward you, slide the radiograph into the incisor slot. When the radiograph is properly mounted, the side with the raised dimple will face you, and the incisal edges pointing down toward the center of the mount. 5. Work outward from the central incisor slot, inserting the rest of the maxillary radiographs in the following order: cuspid areas, bicuspid areas, and molar areas. 6. Insert the mandibular radiographs. Start with the radiographs of the central incisor areas and work outward. As before, the raised dots will be toward you and the incisal/occlusal surfaces of the teeth should be pointing upward toward the center of the mount. When you have inserted all of the radiographs, hold the mounted radiographs up to the viewer. Double check to see that each radiograph is mounted correctly. The panoramic X-ray machine is used to produce an extraoral radiograph that shows both dental arches and the temporomandibular joints (fig. 1-61). The radiograph is made by rotating the tube head and film around the patient while the patient remains stationary. Because of the different manufacturers and models of panoramic X-ray machines used in the Navy, this operation and maintenance will vary. Always refer to manufacturer's instruction manual prior to use. The panoramic X-ray machine and control panel are shown in figures 1-62 and 1-63. Refer to these figures throughout the following discussion. You must be thoroughly familiar with the components shown before operating the machine. 1. Turn on the pilot switch; the pilot light will illuminate. 2. Set the kVp selector switch to the desired voltage. Adjust the kVp meter as a reference for the desired kVp setting. 3. Select the mA settings, to be used. Adjust them according to the manufacturer's instructions. When you find the mA and kVp settings that give the best results, enter them on a technique values chart. Remember each manufacturer's film is different, so follow the recommendations. Figure 1-61. 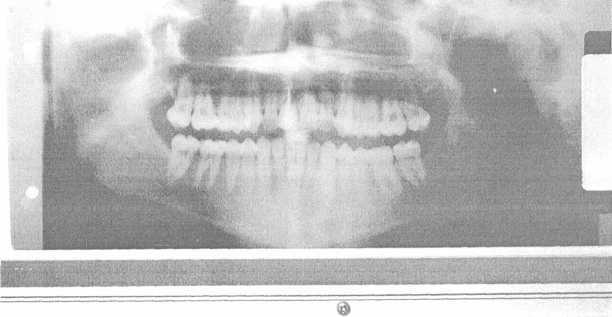 - Typical panoramic radiograph.